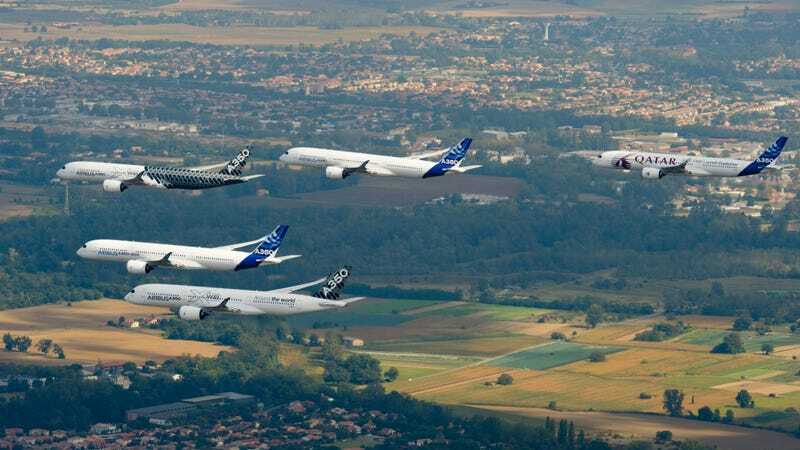 Airbus staged a formation flight of its five A350-XWB test planes on Monday morning in Toulouse, France, a day ahead of the expected certification announcement for the newest widebody jet on the market. Check out some of the awesome pics captured by Airbus, as well as a video. The flight showcased $3 Billion worth of aircraft, which featured four different paint schemes, also known as liveries. The lead plane had a special woven carbon fiber-patterned livery. The two jets behind it wore the Airbus corporate "house" livery. Of the two planes trailing behind those, one had another carbon fiber livery, and one was painted for Qatar Airways, the A350 launch customer.